Create a stunning walk-in shower with this 40mm low profile shower tray from Premier. Simple and easy to install and made from strong and durable ABS capped acrylic with a excellent surface finish, provides a great showering experience. 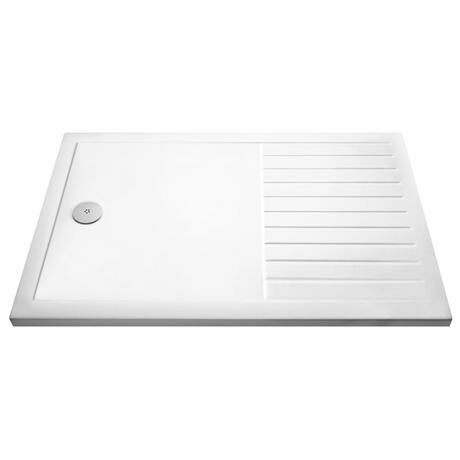 Designed for wet rooms and walk in showers, this shower tray has a raised drying area. Available in a choice of sizes. This shower tray comes with a lifetime guarantee. Complete a beautiful and practical showering area with the rectangular walk-in shower tray from Premier. It is ideal for creating a hygienic and contemporary atmosphere in the bathroom as it offers a sleek design built with you in mind. Made from high quality materials for a strong and durable finish, it can withstand the daily ware and tear of the bathroom. The drying are gives you ample space to wipe down after a shower, leaving the rest of the bathroom open for general bathroom usage, utilizing any space you may have. Hi, thank you for your message. The waste would be side/top depending on the angle you look at the tray. The placement on the image is correct. Hope this is some help, thanks! "Very good product, Just as described, Was a bit worried when ordering on-line as I like to see and feel product. But everything was perfect."